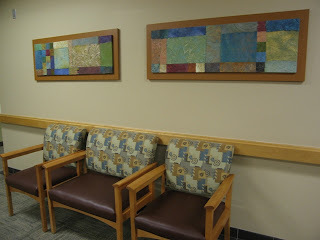 Betty Bothereau and Winky Merrill recently installed artworks in a medical center in the Worcester, Massachusetts area. 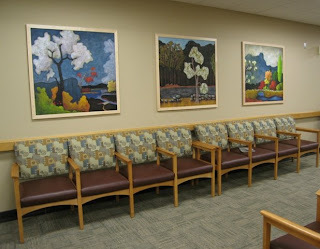 Working in consultation with the medical staff, facilities representatives and the architect, L'Attitude Gallery art consultants selected artwork to enhance an internal medicine waiting area. 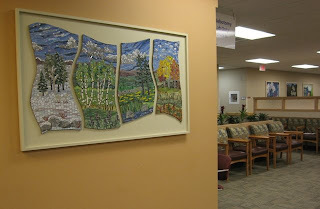 Many of the artists hail from the Worcester area and the artworks are in a variety of media including paper, mosaic, photography, pastel and painting. We've opened our new show, "Off the Wall", featuring 2D and 3D artworks by Bernice Koff, Corinne Okada, timothy Craig, Tim Harding, Ted Camp, James Aarons, Micheal Gustavson and others. "Big Red Stripe", below, is a ceramic 3D wall piece that adds dimension to the wall. 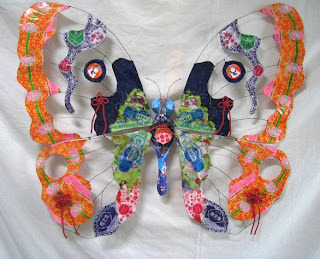 "Clover Flower Knot Butterfly" by Corinne Okada in Asian candy wrappers and mixed media. Election Reds, Whites and Blues..
During this election season, show your colors by viewing some of our colorful pieces of artwork. 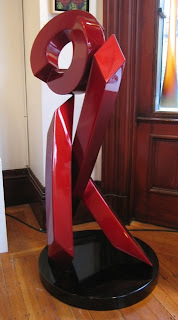 Rob Lorenson’s “Reaching for the Sun” in red is a spirited candidate for your attention. 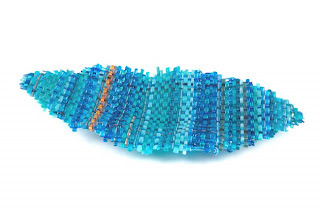 Woven glass artists, Markow and Norris, have created the perfect blue piece to vote for in their “Goldfish Petal” table sculpture. 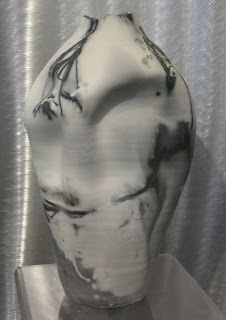 The beauty of Jill Fishon-Kovachick’s white raku vessel, “Winter," does not need to be debated, it’s a clear winner in terms of ceramics.